Water features in gardens are a source of enjoyment to many gardeners. They add an interesting aspect and can be very restful. There are a lot of products and advice available for anyone wanting to start an aquatic garden. You don’t need a lot of space and a basic pond doesn’t have to be very expensive. Some gardeners like to go a bit further and put a fountain or a statue with the pond. The pond will benefit from some water garden plants. In addition to assisting in keeping the pond in a healthy condition, they will be an attractive feature. 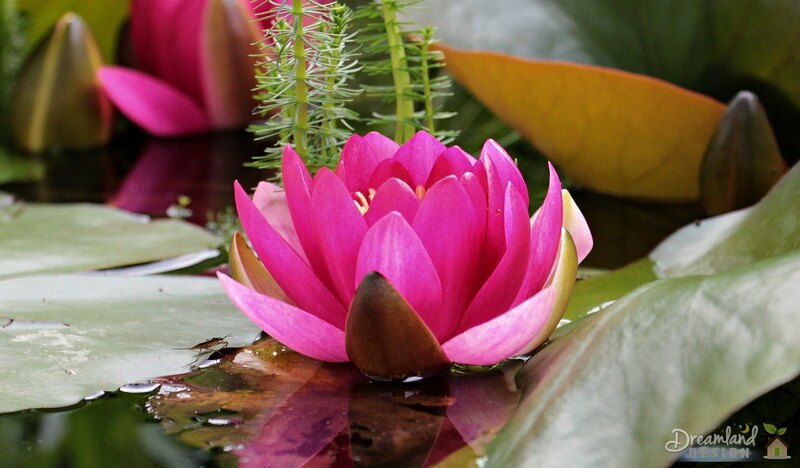 Water Lillies are particularly popular for their delicate flowers that sit on the water’s surface. Most of the plant is submerged and they need to be placed 1-2 feet below the surface. They are put into containers sometimes. Another example of a submerged water plant is the Parrot Feather. These plants are an asset to the aquatic garden if there are fish in the pond because they stimulate oxygen. There are other plants that are visible on the surface but their roots lie underwater. This type is called marginal plants and they are placed in a pot at just below the surface. Varieties include the iris, arrowhead, lotus, elephant ear or pickerelweed. The other sort of plants, suitable for an aquatic garden, are the ones that float on the surface. These are very useful as they decrease the presence of algae in the pond by providing shade. They need careful control however, as they grow and spread very quickly. Varieties include the water hyacinth, water spangle, water clover and mosquito fern. Of course, a water garden is most appealing when it contains fish. Goldfish, such as shubunkin, common goldfish and wakin, are very popular. Koi are very attractive and some varieties are expensive. Other choices include minnows, golden orfe and golden tench. Most fish survive happily without heating but a heater may be needed in particularly cold places during winter, just to stop the water from freezing up. Pumps and filtration equipment is necessary, in order to maintain the oxygen levels that the fish require. The reason that pond water appears green is because of the growth of algae. This must not be allowed to take over, as the blanket weed variety is apt to do if not removed. It is a particular problem during warm weather but there are various methods to keep algae under control in an aquatic garden.